Stroke Risk Stratification Schemes in Atrial Fibrillation in the Era of Non- Vitamin K Anticoagulants: Misleading and Obsolete, At Least for the “Low-Risk” Patients? Background: The thromboembolic risk of atrial fibrillation (AF) is significantly mitigated by oral anticoagulation (OAC) therapy, albeit at an increasing bleeding risk. The general principle is that the potential harm conferred by possible bleeding must not exceed the expected protective benefit of OAC. Over the recent years, the CHA2DS2-VASc score has been proven to be superior to other scores in identifying ‘low risk’ AF patients. However, even this latest score does not incorporate all possible risk factors causing a high thromboembolic risk, while the individual components of the CHA2DS2-VASc score do not seem to carry equal thromboembolic risk. Thus, the quest for more reliable risk stratification schemes and identification of “truly low-risk” patients has been continued. 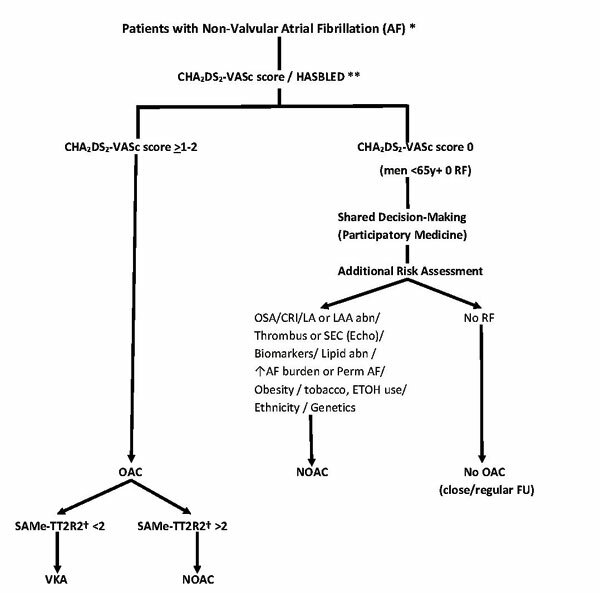 Objective: In this article, data concerning the risk stratification schemes and particularly the CHA2DS2-VASc score of 1 and 0, are critically reviewed and a practical algorithm is proposed for all and more specifically for the “low-risk” patients. Results: A variety of clinical, echocardiographic, genetic and biochemical or coagulation parameters can also predict adverse thromboembolic events in AF patients. Nevertheless, the addition or adoption of more complex schemes may defeat the purpose of simplicity and practicality, demanding more extensive and costly assessments to decide on a relatively simple question, that of the need for anticoagulation. In the era of non-vitamin K oral anticoagulants (NOACs) proven equivalent or superior to vitamin K antagonists (VKAs), this may not be necessary any more, and a simple recommendation of dispensing OAC therapy almost to every patient afflicted by AF may prove to be a more practical and a ubiquitous approach, as long as safety is ensured by these newer agents. Conclusion: The accumulated evidence appears compelling that at least those with a CHA2DS2- VASc score of ≥1, should receive OAC. With regards to those with a CHA2DS2-VASc score of 0, one may wish to consider additional risk factors (Figure 1) beyond those in scores to decide whether there is a need for thromboembolic protection that outweighs the bleeding risk, preferably with use of NOACs. Finally, an individualized strategy and clinical judgement may be necessary by assessing patient's clinical and financial status, preferences and choices in a shared decision-making or participatory medicine approach. Keywords: Anticoagulation, vitamin K anticoagulants, bleeding, non-vitamin K anticoagulants, risk stratification schemes, CHA2DS2-VASc score, lone atrial fibrillation. Title:Stroke Risk Stratification Schemes in Atrial Fibrillation in the Era of Non- Vitamin K Anticoagulants: Misleading and Obsolete, At Least for the “Low-Risk” Patients? Keywords:Anticoagulation, vitamin K anticoagulants, bleeding, non-vitamin K anticoagulants, risk stratification schemes, CHA2DS2-VASc score, lone atrial fibrillation. Abstract:Background: The thromboembolic risk of atrial fibrillation (AF) is significantly mitigated by oral anticoagulation (OAC) therapy, albeit at an increasing bleeding risk. The general principle is that the potential harm conferred by possible bleeding must not exceed the expected protective benefit of OAC. Over the recent years, the CHA2DS2-VASc score has been proven to be superior to other scores in identifying ‘low risk’ AF patients. However, even this latest score does not incorporate all possible risk factors causing a high thromboembolic risk, while the individual components of the CHA2DS2-VASc score do not seem to carry equal thromboembolic risk. Thus, the quest for more reliable risk stratification schemes and identification of “truly low-risk” patients has been continued.